A few pics of the setup I used to create my current Avatar. 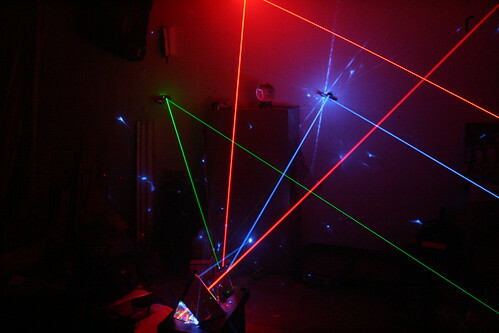 Lasers were set up on my workbench, pointed at some 1st surface mirrors mounted to the wall. Reflected down to 2 polyhedrons comprised of 1st surface mirrors. 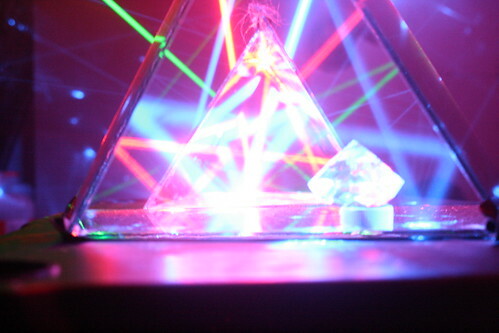 The 1st set is a triangular prism, with 1 open end 'accepting' the incoming beams, and the other open end butted up against a truncated triangular pyramid. Both sets have the reflective surfaces all pointed inward for obvious reasons I wish I had taken more pictures with this setup. Hope you dig 'em! 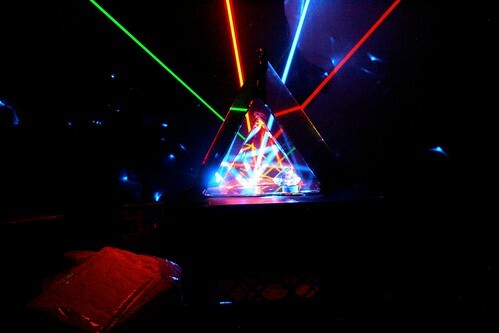 Oh, I see you do have some prisms. Nice effect. It looks like you had to try photos from many angles to get the shot you wanted. You sure do some impressive work my friend. What’s that laser that looks like 589? IIRC, that orange-ish/yellowish beam is actually a LG DVD 24x diode. I only had that red (650nm? ), the DPSS 473nm and a green of some sort in this shot - so the one in question is the same beam as the one that is without-a-doubt red. The angle / camera settings did that as it was bouncing off the wall-mounted mirror, on its way to the 2 groups of mirrors below - pretty awesome. Very nice shots. 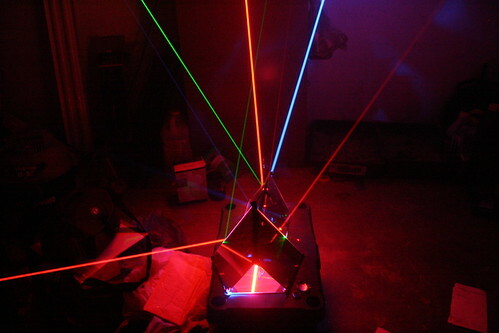 I love creative laser use. And how I made my avatar? Just random result during holographic laserpainting technique. I'm writing my next issue of TaoLiim, where some secrets of Project A are presented. There is interesting math and science behind my art, so I hope it will improve understanding how our universe works. Math, logic, science, art, psychology and Complexity Philosophy with experiments will be included in next TaoLiim.